Alice Kent Stoddard was born in Connecticut, but spent much of her career as an artist in Philadelphia and on Monhegan Island in Maine. She studied with Thomas Eakins, William Merritt Chase, and Thomas Anshutz at the Pennsylvania Academy of Fine Arts, as well as at the Philadelphia School of Design for Women. While serving with the YMCA in France during World War I, Stoddard executed many drawings and paintings of the battlefield. However, she is most widely recognized for her bold landscapes and marine paintings of Maine, as well as for her numerous portraits. She exhibited frequently throughout her career at the National Academy of Design, and was elected an Associated Member in 1838. 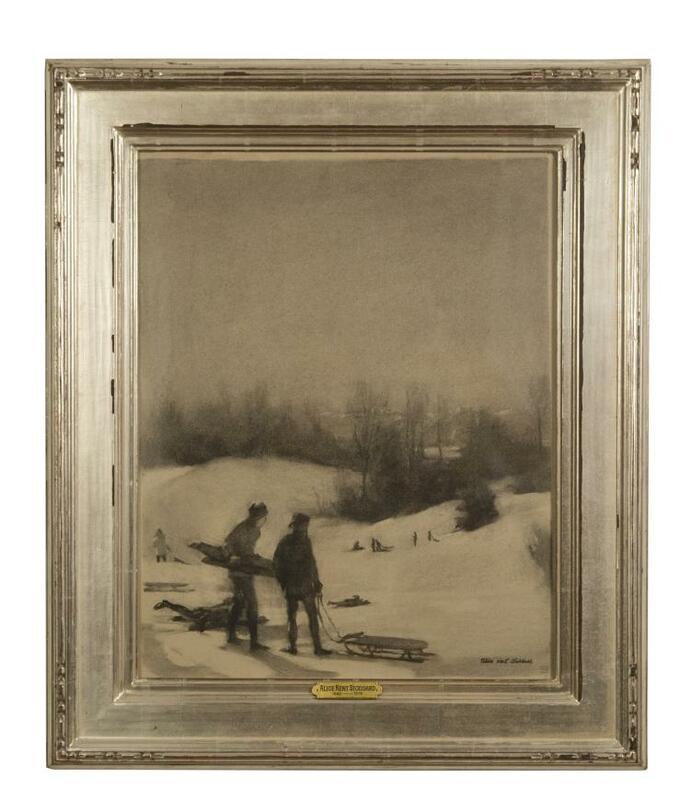 With Sledders, Stoddard has appropriately chosen the medium of drawing, with its high contrast of black on white, to create this winter-themed scene. Using chalk on illustration board, she evokes a scene of play and wonder in an otherwise bleak yet serene landscape. 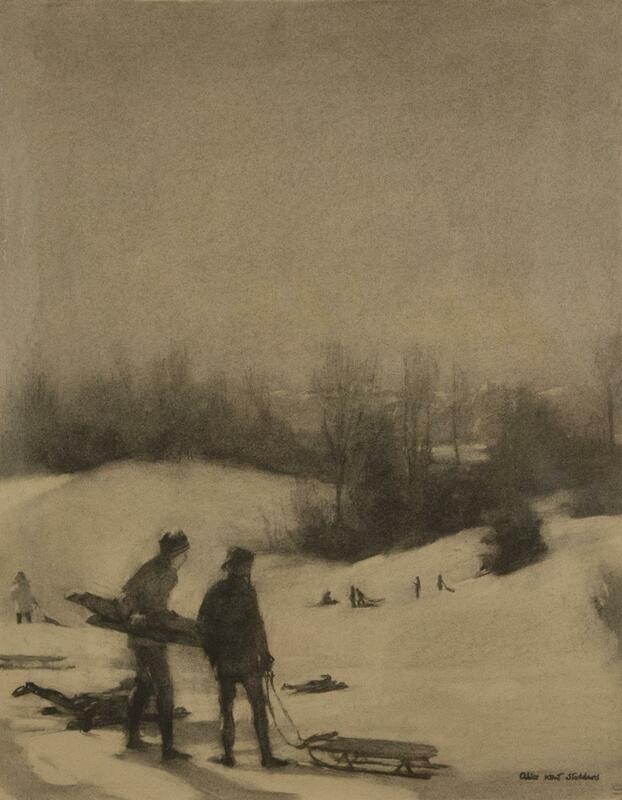 At the foreground of the drawing we see two figures, presumably young, with their backs turned toward the viewer and looking at the other sledders and the snow- covered hills. 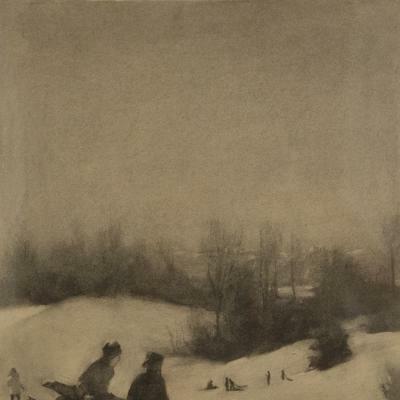 By assuming their point of view, Stoddard draws our eye first toward the sledding figures on the left of the drawing and then back around toward the hills and sledders in the middle distance. The gently rolling snow covered hills further draw the viewer’s attention around and through an ever-receding horizon. Stoddard gives sharp and crisp details to the figures in the foreground, but then gradually lightens her touch as the scene recedes. The trees at the distance are handled with delicate and soft, thin lines. With her judicious application of chalk, she has left the natural color of the board untouched in places. This effect gives a believable sense of the soft winter light. Please notify me when works by Alice Kent Stoddard become available.